Scrambling to put together the perfect party details in time for your annual Fourth of July cookout? You provide the Zweigle’s, we’ll provide the party ideas. Everyone loves a party hack or two, so check out some of our favorite ideas below to make this year’s celebration your most epic kickoff yet. Build your own easy and chic DIY bug repellent candle jars. Brew up this kid-friendly patriotic punch. Decorate with easy patriotic lollipop topiaries. Whip up this delicious red, white, and blue dessert pizza. Assemble a squirt gun station for the kids. 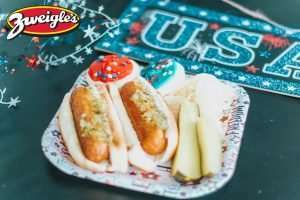 Make these quick and tasty firecracker dogs (featuring Zweigle’s hots, of course!). Try this red, white, and blue pasta salad recipe. Assemble your own Zweigle’s hot dog bar. Serve up 5-minute patriotic fruit kabobs. Make your own American flag vegetable tray. Set up a patriotic Italian soda bar for your guests. DIY these yummy Fourth of July sugar wafers for dessert. Set up a Fourth of July scavenger hunt for the kids. Decorate with these simple DIY patriotic pillows. These 14 Fourth of July party hacks are no-brainers. Taking little time and effort on your end, they’ll make your guests think you spent weeks preparing for your impressive Independence Day celebration. Now that’s what we call a party hack! We’re wishing everyone the best of luck in your party endeavors, and we hope you have a wonderful holiday from everyone here at Zweigle’s.